When I created my Facebook account, I was confused about its notification settings. I use to get a lot of annoying and unnecessary notifications from various groups, Pages & Friends. As Facebook changes their features from time to time, I don’t know how to turn off and manage facebook notification settings. Whenever I switch on my Mobile data after a while, I used to get a lot of notifications. If you experienced the same situation, then you are at the right place. 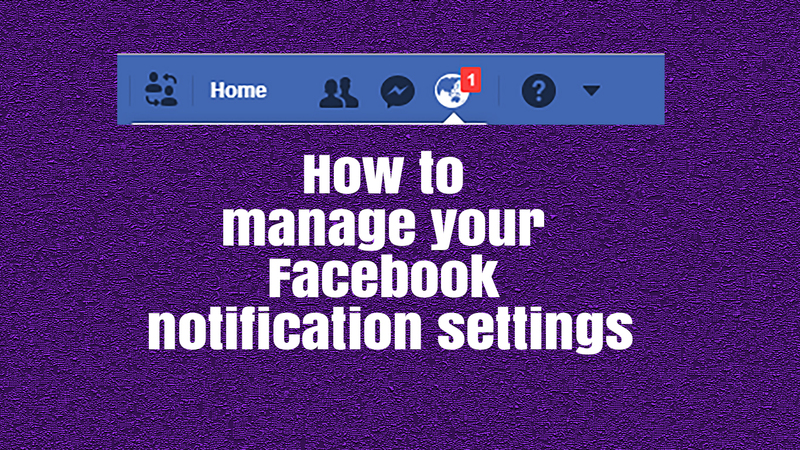 In this article, we will discuss to manage Facebook notification settings. Facebook Notifications will notify you the moment or activity taken on Facebook that involves you. These notifications include Inbox messages, Birthday’s, On this day, tags, replies, comments, reactions, mentions, page notifications, Group activities and many more. In addition to these, you can also get notified for game requests Live videos, etc., Getting notified for all activities is equally important on Facebook whereas many of you are not aware of hidden notifications settings where you can control by yourself. Either they reacted to your post or replied/liked your comment. You need to get notified of every update on your Facebook. You can turn off your notifications entirely or adjust the settings according to your requirements. To know about settings first, you need to navigate to the Settings page. Click on Notification button which looks like Globe and then click on settings in the upper right corner. Here you can find different setting options for Facebook. Here you can’t turn off the notification setting for the activity which involves you. It always remains turned on. If you don’t want to play a sound when you received a new Notification, then you can turn off this option. Similarly, you can do for Message notification too. Because sometimes we’ll get frustrated with those annoying sounds during our busy work. So this simple solution can solve your problem to get rid of those annoying sounds. Birthday notifications are essential to get notified of your Girlfriend/BoyFriend, Friends and other birthdays. In the first place, you should always keep this setting turned on. On this day Facebook notification settings. This feature gives you a look back at your previous posts which you’ve posted on the same day past years. It’s simply called as Memories to look back on. Facebook started notifying us about this notification and believe me you’ll enjoy this feature. You can choose your close friends by visiting Friend lists option at left sidebar in Facebook desktop version. Add your close friends to the list. By doing this, you can show specific posts to only your close friends on the list. Instantly you’ll get a Notification from your Close Friends list for their activity. You can turn off this if you don’t want to receive notifications. Well, this would be annoying. Nowadays tagging became one of the most irritating words on facebook. You’ll get notified whenever your friends tag you in their photos. Here there are 3 options, and among them, you can choose one option. You can adjust the settings for Friends, Friends of Friends and Everyone. Sadly you cannot turn off this feature. You can Adjust Tag Review option to get rid of tags. If you manage any pages then you likely to get notifications for that Page activity. Well, this would be an annoying situation when you get notifications for every like and comment on Page activity. You can simply On or Off the Notifications. Another new option is available named Digest. This feature allows you to receive daily summaries of updates to content rather than getting an individual notification for each activity. You can just select one option from 4 available options Named All posts, Friends’ Posts, Highlights or Off. By selecting All posts, you can get notified for every activity from the group which you’re active. If you choose Friends’ Posts, then you get notified of only activities done by people on your friends’ list. If you pick Highlights, then you’ll get notified of the most active post in the group. Select Off option if you don’t want to get notified of Group activities. In reality, this is the most annoying feature. You’ll always get those annoying notifications from Facebook Apps. You can turn off these notifications by Clicking Edit -> On or Off. This feature will help you to get notified when there is a live video of your Friends or Pages liked by you. You can Turn On, Suggestions Off or All off Notifications. This feature allows you to get notified of New Local Business page suggestions in your Local area. If you want to receive notifications, you can turn on by clicking on Edit – Turn On. Hence you can turn off if you don’t want to get notified. This feature helps you to get notified right through your Email inbox. Hence you can get All notifications, Important Notifications or only notifications about your account, security, and Privacy. You can receive notifications for Live Videos as well as Other offers. Either you can Turn off or Turn on Notifications according to your requirement. By enabling this option, you can see your notifications instantly in the corner of your computer screen even when Facebook closed. This feature helps you to track Facebook activities whenever you connect the Internet to your PC. You can adjust the Push Notification for your mobile by following this tutorial. Get Notification directly to your Mobile Via Text Message. If you want to receive Facebook notification to your mobile phone, you can add your Mobile Number Here and confirm with a verification code. By this process, you can get Facebook notifications directly to your Mobile via text messages. Don’t worry; you can hide your Mobile number by adjusting settings on your profile. Select & Tap the Last tab on Top right corner of the screen and then tap on Settings -> Account Settings. And then tap of Notifications. Now you’ll get navigated to Notification settings. Here you can just tap on the required option and choose the best setting. These settings can modify as same as Desktop notifications settings.